1. Inthe solar system, planetary revolution is a first order reaction against thegravity of the Sun, whereas planetary rotation is a secondary reaction againstthe gravity of the Sun. As the distance from the Sun increases and the effectof the Sun’s gravity weakens, planetary first order reaction gradually transitsinto secondary order reaction (revolution decelerates, rotation accelerates). 2. 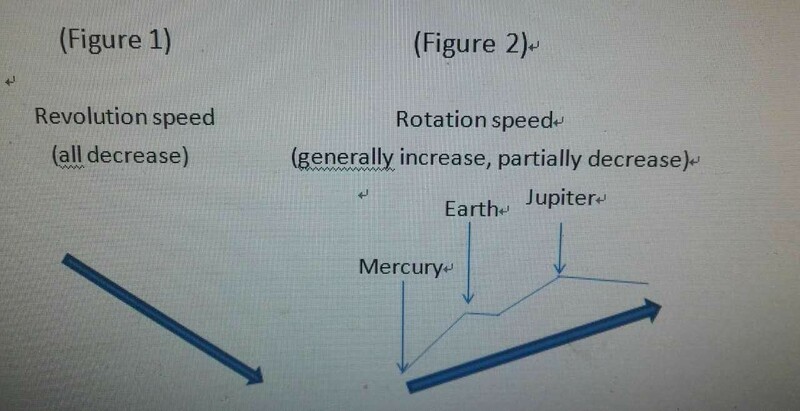 Planetaryrevolution speed and rotation speed mutually restrict each other in aphenomenon I call “the Spinning Top Effect”: the faster the revolution, theslower the rotation, and vice versa. 3. Rotationspeed of a planet is associated with its mass: the bigger the mass of a planet,the more it’s affected by the Sun’s gravity and the faster the planet rotates.A planet’s mass and rotation speed determine the planet’s size of gravity,thereby determine the mass and number of moons it attracts. 4. Thereverse rotation of Venus is an inevitable reaction to its acceleration ofrevolution speed. At the end of thisessay, the causes of the formation of gravity and action at a distance arepresented. According to the tableabove, planetary motion in the solar system has the following 4characteristics. 1. As the distance from the Sun increases, revolution speedsof the orbiting planets show an overall decrease. Planetary rotation speedsgenerally increase, partially decrease. 2. As the distance from the Sunincreases, a planet’s revolution slows down while rotation speeds up. 3. The farther away a planet is situated from the sun,the bigger its mass and the faster it rotates. It also captures more moons. 4. Venusexhibits the special phenomenon of reverse rotation. 1. Planetaryrevolution is a first order reaction against the gravity of the Sun (the closera planet is to the Sun, the faster it revolves around it); planetary rotationis a secondary reaction against the gravity of the Sun (the farther away aplanet is from the sun, the faster it rotates). 2. Planetaryrevolution speed and rotation speed mutually restrict each other. The faster aplanet’s revolution, the slower its rotation; the slower a planet’s revolution,the faster its rotation. As a planet’s distance from the sun increases and thesun’s gravity weakens, planetary first order reaction gradually transit intosecondary order reaction (revolution speed decreases while rotation speedincreases). 3. Planetaryrotation speed is related to the planet’s mass: the bigger the mass, the moreit is affected by the sun’s gravity and the faster it rotates, which leads tothe phenomenon in local scope where a planet’s rotation decelerates as its massdecreases (see figure 2). A planet’s mass and its rotation speed determine itsgravity, which determines the mass and number of moons the planet is capable ofattracting. 1. In thesolar system, Mercury is the closest to the Sun and is most affected by itsgravity. Therefore, Mercury’s revolution velocity is the greatest. Mercury’sfast revolution is a typical manifestation of planetary first order reaction(When at perihelion, Mercury’s orbital velocity is even faster, which meansthat planets revolve faster when closer to the Sun). Owing to the restrictiverelation between planetary revolution and rotation, as a planet travels fartheraway from the sun, it becomes less affected by the Sun’s gravity, its firstorder reaction gradually transits into secondary order reaction (revolutiondecelerates, rotation accelerates). 2. Themutually restrictive relation between planetary revolution and rotation can beexplained as the “Spinning Top Effect”: when the rotation speed of a spinningtop fastens, the distance it travels decreases. When rotating at a very highspeed, the spinning top even appears to be not travelling forward at all. Onthe contrary, to increase the distance the spinning top travels, its rotationspeed must be reduced. Similarly, the rotation speed of Mercury is the slowestcompared to other planets of the solar system, whereas its revolution speed isthe fastest. This is the manifestation of the restrictive relation betweenplanetary rotation and revolution. 3. Planetaryrotation speed is not only controlled by the distance from the Sun, but also bythe planet’s mass: the bigger a planet’s mass, the more it’s pulled by theSun’s gravity, and the faster its rotation speed (secondary order reaction).This phenomenon consequently leads to partial yet regular changes of planetaryrotation speed. For instance, Mars is farther away from the Sun than Earth butits rotation speed is slower than Earth’s by 37 minutes. This is due to thefact that Mars’ mass is smaller than Earth’s, therefore Mars is less controlledby the Sun’s gravity. Likewise, even though Saturn, Uranus and Neptune arefarther away from the Sun than Jupiter, because their masses gradually reducefrom one to another, their rotation speeds reduce as well (see figure 2:Jupiter captures the biggest number of moons and rotates the fastest among allplanets of the solar system because of its large mass, which is 2.5 times aslarge as the total mass of all the other seven planets).But these 4 planets areall farther away from the sun, their masses are all bigger than the first 4planets, therefore they attract more moons. Another thing to note is that, thepartial decreases in planetary rotation speeds don’t affect the overalltendency that planetary rotation speeds increase as planets sit farther awayfrom the sun. It’s important to note that whilethe revolution cycle differences between any other two neighboring planetsgradually increase, the revolution cycle difference between Venus and Mercuryis smaller than it should be, which means Venus is revolving slower than itshould. As shown above, the revolutioncycle difference between Mercury and Venus is 137 days (represented as 1);between Venus and the Earth it’s 140 days (represented as 2) and 322 daysbetween the Earth and Mars. After Mars, the revolution cycle differences betweenevery other two neighboring planets keep increasing evidently. However, 1 isalmost the same as 2 when 1 should be much smaller than 2, which proves thatVenus is revolving slower than it should. As we know,Venus is known as “the twin sister of the Earth”. Its mass is about 4/5 of themass of the Earth. Despite the fact that the distances between Mercury and theSun, Venus and Mercury, Earth and Venus are approximately equal, compared toits neighboring Mercury, Venus is much bigger in mass. Because Venus is revolving slower than itshould, when pulled by the Sun’s gravity, Venus needs to increase itsrevolution speed in order to offset the insufficiency in its revolution; the recoil force created by this increaseresulted in the reverse rotation of Venus. Owing to the mutually restrictive relationsbetween planetary revolution and rotation speeds, when Venus speeds up its revolution, inevitably its rotation would be restrained. In otherwords, when trying to accelerate revolution,Venus would consequentially produce a reverse thrust to its rotation. It is the reverse thrust (recoilforce) that caused Venus’ reverse rotation. Since the reverse rotation of Venus iscaused by the reverse thrust (recoil force) from its accelerated revolution,the result of the counterbalance between its revolution acceleration and therecoil force is that there is no actual increase in Venus’ revolution speed. Thephenomenon of gravity: all planets in the solar system revolve generally on thesame plane as the Sun’s rotation orbit; all planets revolve around the Sun inthe same direction as the Sun’s rotation; the closer a planet is to the Sun,the faster the planet revolves around it; the bigger a planet’s mass, thefaster it rotates and the more moons it attracts. 2. Themain cause of gravity: the centripetal force caused by the rotation of the Sunis the main cause of the Sun’s gravity. Whenthere are few external forces, the “independent” existence of the Sun’s gravityprovides a significant condition to its action at a distance. In general, there are twoscenarios in which force can be given full play: 1. Direct contact to thetarget object (no energy is wasted) or 2. There is a spatial distance from thetarget object but there is no obstructing medium in between (no energy iswasted as well). These two scenarios are essentially equal in that there are nomedia involved. How is the Sun’s gravity realized“without waste”? In my opinion, the most ideal condition is that no obstructingmedia is involved in the space between two objects. In other words, a “vacuumstate” is an essential condition to “pull objects closer to each other indistance”. Although there is no absolute “vacuum” in space, the “near-vacuum”environment in space makes the action at a distance of the Sun’s gravity apossibility (experiments are recommended to be conducted as circumstantialevidences to this opinion, for instance, an experiment on thedistance of magnetic force in both conventional and vacuum environments).